Six reimagined fairy tales set in the Grishaverse. 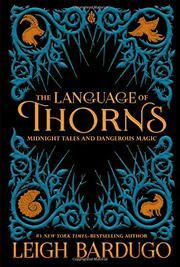 Bardugo returns to the setting of Shadow and Bone (2012) with both original tales and familiar ones retold. Three are set in the Russia-like Ravka, including “The Witch of Duva.” This “Hansel and Gretel” variant plays on stereotypes about villainy held by protagonist Nadya. (It also replaces candy with mouthwatering meals: “crispy roast goose,” “butter-soaked blini,” “black bread spread with soft cheese,” “hot tea laced with sugar,” “sweet rolls with prune jam.”) From the island nation of Kerch, there’s “The Soldier Prince,” a retelling of The Nutcracker that raises questions about the selfhood of magical creatures. The Fjerdan “When Water Sang Fire” provides a villain origin story for “The Little Mermaid” that owes far more to Disney than to Hans Christian Andersen; it’s nevertheless gorgeously otherworldly. Only the Ravkan stories offer substantial local flavor, though Zemeni Ayama is brown-skinned while the Fjerdan mermaids are fair. Kipin’s two-color illustrated borders build cumulatively and fascinatingly, culminating in a double-page spread for each story. The more stylized illustrations, such as the thorns and labyrinth building slowly around the “Beauty and the Beast” variant “Ayama and the Thorn Wood,” are the most successful; depictions of people are a little cutesy for the eerie prose.